9:15pm The live feeds return from being blocked for the veto competition. They’re wearing football gear and jerseys. Lolo complains of having a stomachache. Lolo – can you believe this!? I have mud in my hair! Kato – great job guys! 9:20pm Storage room. Natalie and Lolo. Natalie – I am not going to lie… If I didn’t win that my parents would have been like What The F**k?! Lolo – why? Natalie – I was a soccer player all through college. Lolo – I am just going to let you know that I could have totally bit that pain and won but I… Natalie – I know you could have. It was a fun competition for us. Lolo – I just feel that I would have got it more from Kandi. Natalie – agrees. And if anything we’re in this together. That was fun for me and it was win win no matter which way it goes. Lolo – I was definitely feeling sick. If my a$$ was on the line I would have f**king.. Natalie – of course. You only stopped because you were playing against me. We’re the first girls to be at the end… why? Because we’re bad motherf**kin b***hes! I guess we’re running it! Lolo – that was cool though. I just really wanted that win. 9:30pm Bedroom. Lolo and Ricky. Lolo – you know I could have won that one right? Ricky – yeah I saw you guys talking too. Lolo – did you see that I kick with my left and not my right? Ricky – I knew the first time you went up .. you were throwing it. Lolo – she (Natalie) was kind of too at the beginning. But then I was like we can’t both be throwing it. I said this is a team thing. I am not setting you up to get murdered by them. I’ve got your (Natalie) back. And that is true. Honest to god I her her back and your back. Ricky – so what is the plan now? Get it 3-2? Lolo – we are trying to get it so that they don’t know. Ricky – I don’t want them to know. I want them to be surprised. Lolo – the problem is that now Natalie has a very hard thing to do ..they’re going to ask her to use it. They’re going to hound her to use it. How do we get her out of this pickle? Ricky – worst case she just doesn’t use it. Lolo – I told Nat that if I win this thing they’re going to come at me harder because I’m close with Kandi and she is going to ask me to save her. They trust Natalie .. they don’t really trust me. Natalie for some reason is very cool with Kato. If I had taken that win… I would have been about to execute but they would have known instantly. But with Natalie winning, they’re not going to know. Natalie joins them. Ricky – thank you. Natalie – I’m not going to let them run this. Lolo – what are we going to do? Natalie – they’re going to ask me to use it and I’m going to say no. No one f**ks with me. I’m going to attach myself to you. I am going to say that as a part of this 5, I am not comfortable back dooring my own teammate. Period! Done! how are you going to question that? Ricky – they can’t! Lolo – when Natalie asked Tom why are we turning on our own team? He said he (Ricky) was never a part of our team. I never agreed to that. Ricky – I am going to try and keep being friendly. I want them to be shocked so bad! Ricky leaves. Nalalie – I want you, me or him (Ricky) to win. 9:48pm Bedroom. Lolo, Natalie and Tamar. Natalie tells Tamar that she is not using the veto and keeping the noms the same. 10:55pm Kato and Ricky playing cards and then chat out in the backyard. Natalie and Lolo showering. Joey cooking. 11:37pm Natalie and Lolo doing their hair in the bathroom. Tom and Dina chatting about the Mooch and Dina’s memory wall photo. 12:10am Dina and Kandi playing cards. Crikey ! If what I heard is going down..this is a MAJOR shakeup. Joey had offered to stay up (this was last night) and then not change the noms. (That way Ricki wouldn’t be put up. And WHOA! Nat is NOT using the veto. Kandi will be voted out. But..the shocker will be to Tom and kato when they realize there is no longer a Fun Four. Tom unfortunately went power and paranoid nuts. Basically annoyed the whole house. It will change again. Kato is pretty good with everyone and can survive and still win. Nat is going to be the one to beat and it’s hers to lose. I’m a big Kato fan. 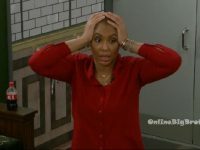 When they announced the cast, Kato was one that I rolled my eyes at (same with Dina, Tamar and Ryan). But I like Kato alot; Dina is nothing like she’s seemed in her past family drama, actually chill. Ryan grew on me because he’s transparent and goofy, not as much of a tool as I thought. Tamar… is still my least favorite. Self absorbed and immature. For once, I’m anxious to see it all play out and like more than one player for the win. Hilarious. Lolo, Nat and Tamar in the room. Apparantly before and during the veto/ Tom was going * Fun, fun, fun, fun fun. let’s have fun, fun, fun. Tamar is going Fun, fun fun during the convo. Nat says : Yeah..how much fun was it for the players on the block? Tamar goes..Fun, fun fun fun..copying Tom. Nat says : Yeah..how much fun, fun fun was Tom the 7 days he was on the block? Well the girls or Ricky better win HOH then. Nat and Lolo are great cast members for me, I like them alot. But so far, they’ve been beaten more than once by the oldest guy in the house and a dude with one ball. I think Lolo is a big whiny baby! She wants everything her way and wants/needs constant attention. I bet she is a real treat in the Olympic Village. God forbid she doesn’t win in the Olympics. I TOTALLY agree. She is super annoying and fake. When she cried about Ryan leaving, I rolled my eyes. I’m really happy for Natalie Marie, and I’m excited to see the competition. My proposal for the BB Grods is to consider a slightly longer version for the celebrities: Ultimate Celebrity Big Brother including slop and other punishments. I truly squirm at that obnoxious fake laugh of hers, though. the issue with celebrities, even these so-called ones, is that they have actual lives, so you can’t coup them up that long. meanwhile i don’t really get the point of the punishments any more other than the have-not room. the slop and cold showers were a big deal when they introduced them but are kinda played out at this point (but good have-not rooms remain hilarious, though it’s inconsistent season to season). I bet that’s why Scaramucci only came on with a special role; he’s got a wife and 5 kids and he’s worth over $200 million. Also why so few people go on the regular BB over the age of 30. Three months would be a TOUGH commitment. I like that it is shorter. It doesn’t get boring. Celebrities most likely need ‘swag’ to get them to agree to being in the house, including the free laundry (even if there was room for a machine, which could be made, it’s a big house). BB is hunting them down, and not easily, not the other way around. So they can’t have the exact same format as the joe averages who send in their audition tapes. Even celeb adjacent celebrities have agents and lawyers who make the costs of getting them higher. The longer you are trying to lock them in or the more onerous the situation is the higher the costs to contract them. The moral of the story – Lolo and Nat are NOT good for any alliance. They’ve broken up two now. Three if you including Tamar and Kandi. Lolo’s too paranoid, and Nat just follows her. I think Lolo should be voted out soon. TeamFun is history. Her sister Toni Braxton was trolling for votes on twitter from her fans. I love Tamar’s sisters; but I wouldn’t have given one vote for her for anyone, even Living Legend Grammy Award Winning Toni Braxton. Me too, makes me think it was “given” to her because she brings drama to the house. Can someone explain how Joey is a threat? I laugh eveytime I hear this. He hasn’t won anything and he’s by himself. They get rid of Jon and Ryan because they said they were strong but I’m trying to figure out the Joey angle. Also, I’m starting to see why Lo Lo is single and can’t get a man.